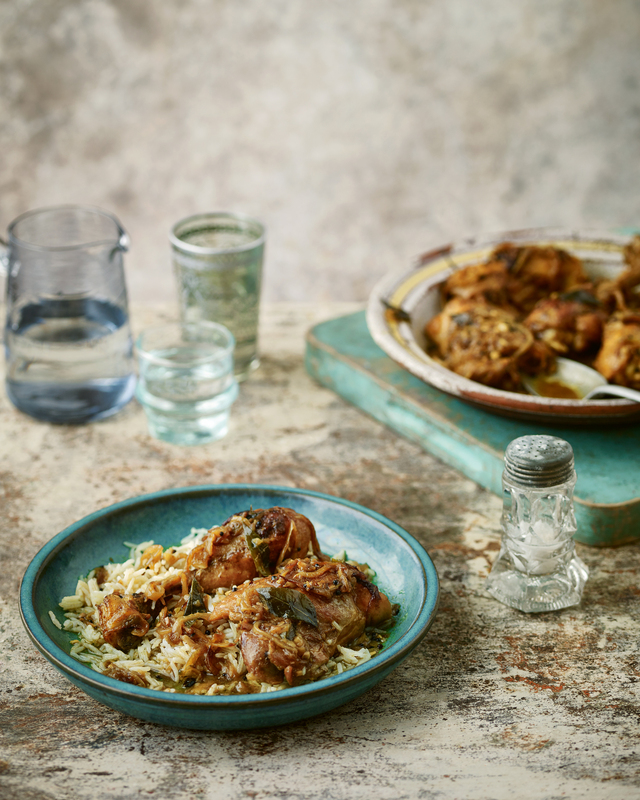 “So different to the heavily spiced chicken curries you may have tried, this dish has a delicate and refreshing flavour that’s best enjoyed with rice rather than bread,” says Chetna Makan, food writer and former Bake Off contestant. Such joy to feed the team @octopus_books_ this morning, food from #chetnashealthyindian just 2 days to publication, order your copies now, link in my profile! 1. Heat the oil in a saucepan over medium–low heat. Stir in the mustard seeds and cook for one to two minutes, until they start to sizzle. Now mix in the curry leaves and, after one minute, add the onions and green chillies. 2. Reduce the heat to low and cook for five to six minutes, until the onions have softened. Stir in the garlic and ginger and cook for another two minutes. 3. Add the salt and spices to the saucepan and mix well. Cook for one minute, then stir in the chicken, increase the heat to high and cook for five minutes, until the chicken is sealed. 4. Stir in the coconut milk, then cover the pan with a lid, reduce the heat to low and cook for 35–40 minutes, until the chicken is cooked through. Serve immediately. To celebrate the launch of ‘Chetna’s Healthy Indian’ I am doing a special dinner @greatgunssocial on @2nd Feb. The menu will be based on the recipes from the book and the the tickets are limited so book soon. Link in my profile! Chetna’s Healthy Indian by Chetna Makan, photography by Nassima Rothacker, is published by Mitchell Beazley priced £20 (octopusbooks.co.uk). Available now.